Gemma Atkinson is a British actress and radio presenter who is probably best known for playing Carly Hope on the ITV soap, ‘Emmerdale’. Since leaving the show she has made a splash in radio taking up residence as one of Key 103 Manchester’s breakfast team. Never one to back down from something new, although she admits she has no dancing background, she has recently been announced as one of this year’s ‘Strictly Come Dancing’ celebrity contestants and is looking forward to the challenge. 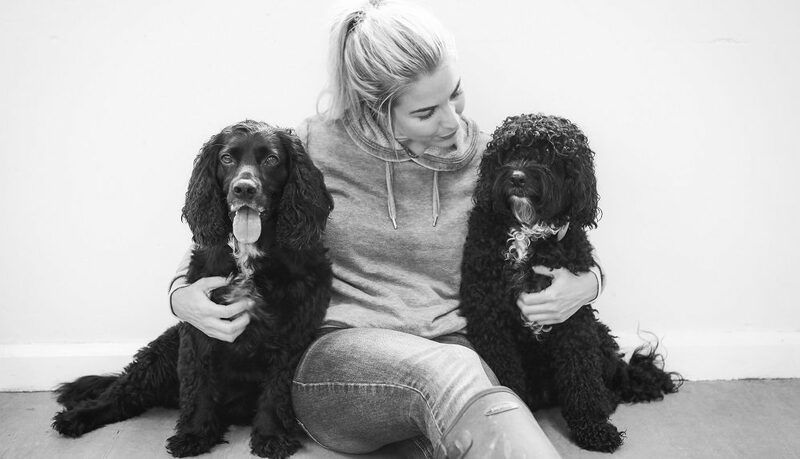 At home, Gemma says her two dogs, Ollie and Norman make her busy life better and it’s her love of dogs that led her to take up the role as president at a Bury animal sanctuary. Kim O’Meara from K9 Magazine caught up with Gemma to find out more. Hi Gemma. Thanks for making the time to chat with us today. We love the fact you’re such a massive animal lover. Where does your love of dogs come from? Growing up we always had dogs in the family. Our first dog was a West Highland Terrier called Fergie. Are you Man Utd fans? (Laughs) It’s funny because I was about two when we got her so had nothing to do with her name, but my dad’s side of the family is Scottish so I think that’s where it came from. We had her for about 16 years and she passed away when I was about 15. To be honest it took us a while to get another because my mum was really wary about getting another dog. They say one of the worst things about having a dog is that they’re not here for long but are such a big part of your life, so you really feel the loss when they go. So it was a big decision to say ‘right we’re going to get another dog’, but then years later we got Ollie and then Norman soon after so we got two instead of one (laughs). Literally, I couldn’t be without them now. I feel like they’re my kids because I talk about them the same way people talk about their kids (laughs). I’m with you on that one. Tell us a bit more about your boys. Ollie’s the oldest, he’s a 6 year old working Cocker Spaniel. Norman is 5 and he’s a Sproodle, a Cocker Spaniel Poodle cross. Where did their names come from? Well, Ollie’s name we just liked and thought he looked like an Ollie but Norman was actually named after my grandad who was called Norman too. He loved dogs but passed away before we got Norm so I wanted to name him after my grandad so there’s a little memoir for him. From our photoshoot shots, they both look active boys with big personalities. Yes, it’s funny because they are both very different. I don’t know if it’s because he’s older but Ollie’s a bit like a wise old man. He thinks things through. For example, he’ll run up to a puddle, stop, assess how deep it is, sniff it and then if he feels like it, he’ll go in, whereas Norman’s like a wild child who’ll run and jump in anything without giving it a second thought. He’s a lot more fearless about that sort of thing, Norm. At home when they’re both relaxed, they’re very different to when they’re out. Norman is a bit, well, he’s not a bully but he rules the roost a bit at home. If I bring two of the same toys home he wants them both, whereas when we’re out walking he’s a bit timid and he’s more wary of people and other dogs. Does your mum have a dog now? Well, Ollie’s my mum’s dog really. I got Norman on my own but they’re always together since they’ve been together from puppies really. Ah, I see. What about the rest of your family? It sounds as though your family are big dog fans. My sister has a Shar-Pei called Jackson, he’s a massive loaf of a dog (laughs). He’s lovely. And before Jackson, she had Max, who was a Staffordshire Bull Terrier. My grandma also had a Staffordshire Bull Terrier too so the whole family have always been around dogs. I can’t imagine my life without a dog now. I’ve said for the rest of my life I’d like to have a dog. I just think they’re great company and so loyal. All they want to do is make you happy. They’re good therapy, aren’t they? Yes exactly. I mean there have been times when I’ve been going through difficult times and I’ve just come home and sat on the couch and had a little cry and it’s like they know what you need to cheer you up. Ollie does this thing where he nudges you with his nose to get cosy under your arm. They are definitely good therapy. Over the last year, you’ve taken an active role at Bleakholt Animal Sanctuary. How did you get involved? As a kid I used to go up to Bleakholt with my family to look around and see the animals and donate food and toys and stuff, so because they’re such a local charity it’s always been one that I’ve been aware of. But then when I was in ‘Emmerdale’ I was asked to take part in ‘The Chase’ on ITV as part of a team and we were all trying to win money for charities of our choice. We all ended up winning around £25,000 each and I wanted to donate it to Bleakholt so when I went up to tell them that I’d won this money for them and off the back of that they asked me if I’d like to be more involved as a thank you and I said ‘yes, absolutely’ so it’s been about a year now that I’ve been more hands on. And it’s their 60th birthday this year isn’t it – that’s an amazing achievement. It is. When I heard about it I said, ‘what are we going to do for it?’ and they said there were no plans and I thought ‘you can’t have a 60th birthday and not do anything’ so we arranged a silver jubilee ball. It’s the first one we’ve done and the first time I’ve organised anything like that too on that scale, so it was a learning curve but with the help of Bob and all the volunteers, a local hotel and the community getting behind it, it was a really big success. Bleakholt is such a well-known and well-loved charity in Bury that everyone mucked in. We had a band and the girls from Emmerdale performed with me and we ended up having a really good night. Thank you. Yes, we raised over £10,000 so I came away saying the only problem is that now we need to top it next year (laughs) because it’s something I want to try and do annually now because it went so well. Balls and events aside, is there anything you’ve learnt from being more involved with the rescue that you didn’t know before? What shocked me is the number of animals that need help. Bleakholt is constantly trying to find room for new animals coming in and a lot of charities, like ours, aren’t funded by the government. Every time I go up there are new faces. Equally, I’ll see that old faces have gone to new homes and that’s good because they can start a new life but as soon as one’s rehomed, there are always dogs waiting to take their space. It’s awful, isn’t it? We work with lots of animal rescues through dogsblog.com and similarly to you, I didn’t quite know the extent of the situation until we were involved. Some of the stories I hear about what these animals have been through is something I can’t quite comprehend and won’t ever forget. I’ll never get my head around animal cruelty. There’s nothing that makes me more angry. We’ve had people just come down and leave their dog at the gate and drive off. I mean I know some people’s circumstances can change but I don’t think that’s always why people do it. I have a house that I rent out and this couple called up because they really wanted to rent it and they told me they had a dog. I told them it made me like them even more (laughs) and that I had two dogs and it was no problem. They’d been turned down by three other properties and they were thrilled. I think sometimes in those kinds of instances some people will just accept it, move in and just give the dog up but I think he’ll forever wonder what he did wrong to be given up. We met two dogs when we shot with you at Bleakholt. Can you tell us a bit about them? Yes, Biff, the brown brindle boy has been at the sanctuary for a long time. He’s nine years old. He came in because his owners couldn’t look after him any longer, unfortunately. He’s got lots to give and I’d love to see him in a new home. He’s a playful and intelligent boy, he knows lots of tricks. He is not so keen on other dogs so would like a pet free home. He hasn’t had any contact with children and as he is a little more senior we are looking for an adult only home. And the white and black Staffy girl is Lizzie, she’s two years old. She’s lovely, isn’t she? She came into rescue after her owner was very poorly. She’s not coping very well just now with the stress of being in kennels, bless her. I’m sorry to hear that, some dogs do struggle, don’t they. She has so much love to give but just needs a quiet and patient home. We know you’ve had a busy few weeks with the announcement of your place on Strictly – congratulations! Over the course of your career, you’ve done lots of different things – acting, modelling and radio presenting, and now you’re about to get stuck into dancing. Do you enjoy variety? Yeah, I like being busy and making the most of things and making the most of my time, really. I always think if you have an opportunity to do something in life, whether it’s a spontaneous road trip or to try a new food that you’ve never tried, you should do it and make the most of the opportunity, however big or small. Someone said to me the other day ‘you’ve done TV, theatre, radio, film and reality, you’ve done kind of everything but which one do you want to do?’ and I said 'literally I don’t mind'. As long as I’m enjoying what I’m doing, that’s what’s important. We’ve seen the videos on Instagram sharing clips of you with the Key 103 breakfast team, Matt and Mike, dancing along to songs, you always look like you’re having fun. (Laughs) Yeah, it’s a good laugh. I’ve known Toolan (Mike) for fifteen years so he’s been a friend of mine for such a long time that I think we just naturally get on well and Matt I’ve known for about two years, but again he’s from Bolton which is the next town up from me so we’re very similar and have the same kind of sense of humour and values. They’re like two of my best friends really so I’m lucky to be able to work with them. One of the videos I saw recently of you with Mike and Matt showed you dancing. With Strictly in mind, how would you describe your dancing style? (Laughs) To be honest I’m not a dancer at all. When I was about 10-11, I did disco dancing in school but I’ve never done any classical dancing or had any training. So, it’s a bit daunting but I’m looking forward to learning a new skill and seeing how it goes. People always come out of Strictly talking about the benefits, like fitness. Although you’re already fit, I’m guessing that’s an extra bonus to look forward to? Yes, definitely. Loads of people have said to me ‘you think you’re fit until you dance’. One of my friends is a retired pro dancer and his physique is incredible and he’s never stepped foot in a gym. I think because it’s all about your posture that even though I’m fit at the minute it’ll probably still be a challenge because it’s a different type of fitness. It’s kind of like a sprinter doing a marathon or vice versa. Will the show and training take you away from home much? I’m really lucky in that the dancer I’ll be partnered with will be in Manchester so I’ll be able to train in Manchester during the week and just travel to London for the show at the weekend so that’s good. Do you keep in touch with the boys on Facetime when you’re away from home? (Laughs) I do. It’s funny because whenever I Facetime my mum and they hear my voice they pop up like little meerkats and come over, and it’s the same if they’re with me and I Facetime with my mum and they hear her voice. That’s lovely. With their personalities in mind, if you were to swap roles with Ollie or Norman for a day, first of all, who would you swap roles with and how do you think he'd cope being you and what would you love most about being him? Well, I’d probably swap with Ollie because he’s the older, more chilled out one and my days are normally pretty manic. I never get a minute’s rest so I’d love to just be Ollie for the day because I could just absolutely chill. During the day at home, Norman’s on red alert at the back patio doors looking for squirrels constantly whereas Ollie will just go on the couch and be flat out. So, I’d like to swap with him so I could just sleep but I don’t know if he’d cope with my day running around everywhere. I don’t think he’s got the pace for it now, bless him (laughs). Tell us about the last time you laughed out loud because of something you saw Ollie or Norman do. To be honest I laugh at something they do every day because I’m convinced they’re little humans in dogs’ bodies. I mean they constantly eat my socks and it drives me mad but I can’t help but laughing when I catch them. I regularly catch Norman with his head in my wash basket and find Ollie sitting watching the tumble dryer go round waiting for me to open it so he can see what’s inside. Every morning when I get up as soon as I get out of bed I do a stretch and they’ll both do the same downward dog stretch with me in the morning. It always makes me laugh. Ollie also does this really funny thing when he gets excited and he spins around on the spot three or four times like a lunatic. It’s the companionship. It’s knowing that no matter what you do, whether you’ve done something wrong, whether you’re sad or happy, your dog won’t judge you. It doesn’t matter to them if you’re having an off day and don’t want to speak to anybody, they’re your companions through thick and thin. Whatever stage you’re at in your life they will always be there for you. I think as humans we like to think we can be that loyal, but we can’t – a dog’s loyalty is something else. I don’t think we’ll ever match it. Knowing what Ollie and Norman add to your life and thinking about your experiences at Bleakholt, what would you say to someone who might be thinking about getting a dog? Every dog is a product of their environment. A lot of the dogs we have at Bleakholt might bark as you walk past but don’t judge them on that and I think if you can give a dog a loving home, they’ll repay you. It may take time but dogs always trust again. It always gets me with rescue dogs, it’s another one of their brilliant qualities. No matter what they’ve been through, dogs always come around to trusting humans again even though it was humans who hurt them before. When you see a dog who’s come out the other side of trauma, wagging their tail and smiling it’s just a really nice moment to see them happy again. Just remember what a difference you can make by giving a rescue dog a home because they’ll repay you for it in love and loyalty. Finish the following sentence, my dogs are...my best friends. And finally, this is always a tough question so feel free to take some time to think about it, but if Ollie and Norman had the ability to speak and answer one question and one question only, what would you ask them and what do you think that they would say? (Thinks about it) I’d probably ask them if they’re happy with everything I’ve done for them since they’ve been a part of my life and I’d like to think that they’d say ‘yeah, you’ve done a good job and we’re really proud to have you as our mum’ (laughs). Shot by Vivienne Edge Photography, assisted by Rob Battersby for K9 Magazine at Bleakholt Animal Sanctuary.